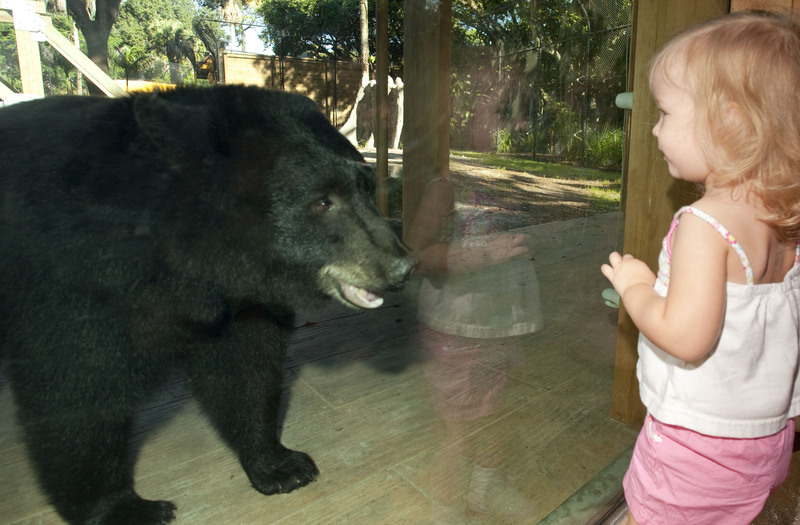 Many Southwest Floridians and visitors have been surprised to learn they share the region with black bears. To educate Zoo guests about living with the state’s wild bears, Naples Zoo created Black Bear Hammock featuring two distinct habitats: a natural habitat and a backyard habitat. Both areas feature clear viewing through glass. 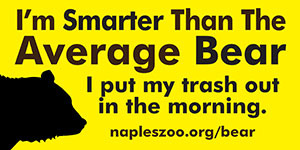 The two bears at Naples Zoo were rescued several years ago and the Zoo created the largest Black bear exhibit at any Association of Zoos and Aquariums accredited zoo east of the Mississippi for them. It features two regions: a backyard side featuring the picnic table, play structure, lanai, and kiddie pool as well as a wild Florida habitat side that tells the story of Cypress logging and features cypress stumps and logs, a shack, and a railroad trestle over a swimming hole fed by descending pools. At the habitat, visitors have the opportunity to learn both basic safety tips if a bear is encountered in the wild as well as how to avoid attracting them to their yard. They will also gain a deeper appreciation of the bears’ crucial role in the local environment. Over 4,000 black bears live in the state and South Florida alone is now home to an average of 1,035 black bears. Being good neighbors means knowing what is best behavior for both bears and people. An excellent resource to start learning is the official Florida Fish and Wildlife Conservation Commission's information on living with black bears in the state including contact information for nuisance bears. Also learn about becoming a bear wise community. You can even find plans to build a secure caddy for your trash if you don't have a garage and other useful information about managing bear attractants. Bears and Trash: Make Your Commitment! If there's one issue that gets bears into trouble the most, it's our trash. With a nose that can sniff out food from a mile away, bears come out of the woods to see what's on the menu in the neighborhood -- especially when the trash is put out the night before. To avoid turning your street into a messy midnight bear buffet, keep your trash inside until the morning. The best time to start this practice is before you have a problem since once bears learn a behavior, they keep coming back. Sign this commitment form and turn it in at Naples Zoo or mail in to get your color decal for just 50 cents to let others know you care about neighborhood safety and the bears. Bear spray has been show to help many people. Learn more about the benefits of this useful tool with links to EPA approved products. Kodiak | Toter | Bearicuda | Bear Saver | Dawg Inc.
Providing links to a non-Naples Zoo web site does not constitute an endorsement by the Zoo or any of its employees of the sponsors of these third-party sites or the information or products presented on these sites.